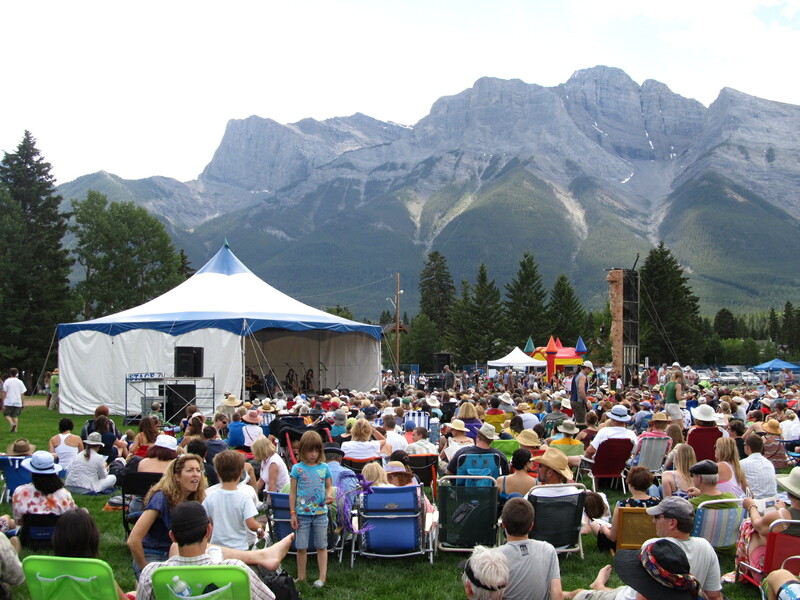 Spent the afternoon at the Canmore Folk Festival. Cloud clusters skimmed the peaks of the majestic Rockies and danced across the face of the sun, poring relief upon the baking multitudes below. We picked up our gear and shuffled lazily between stages two or three times, the highlight for me the humour and hopeful heartbreak of Steve Seskin. But let me tell you about a strange dream I had last night. At first I was young, playing in a sandbox with toy digger machines. At the same time I was counting grains of sand, adding and subtracting them and coming up with all kinds of fancy ways to control and combine. Then I was older. Still playing with the machines the sandboxes bigger and the numbers bigger too, billions bigger and I was like a chess master in the way I moved them around the black and white squares. I might have been married, or not, it doesn’t matter because I was in my head and the sand was black like money and it poured through my fingers. Then I was in an office and a strange woman was handing me a book and I only sneered because who reads books? It was later, after work maybe and I was unhappy, and for some unknown reason I suddenly thought of the strange woman and I still had the book in my pocket. I pulled it out and started to read it. But once I had begun I couldn’t stop. It was a terrifying book at first, the pages weren’t even numbered, and how do you understand anything without numbers? I couldn’t put the book down and soon I had forgotten where I worked and then seemed to be wandering around lost. But curiously I knew I wasn’t really lost. I was in a back alley and a door stood before me and without a thought in my head I went through it. All was quiet inside and I finally finished the book the strange woman had given me, and immediately started another and then another. There was a lot of gibberish in them and they made my head swim and my heart seemed to be racing. It was so beautiful I thought I would die, and then I awoke, and it was morning and we had to get ready because we were making the hour drive into the mountains to attend the Canmore Folk Festival.